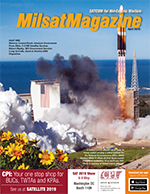 Home/Current Issue >> The Government Satellite Report: COTM... Science Fiction or reality? The Government Satellite Report: COTM... Science Fiction or reality? New technologies are considered “disruptive” when their introduction changes the fundamental way in which we live, work or accomplish day-to-day tasks. The past few decades have seen a lot of new, and arguably “disruptive,” technologies enter the marketplace — from the internet, to the mobile device, to the cloud. When these new technologies are released and begin to gain mainstream adoption, the military starts to analyze and test them to see if there are potential use cases for them in combat. Can they make soldiers better informed or more connected? Could it improve soldiers’ survivability or increase lethality? In many cases, the answer to those questions are, “yes,” and then the hard work begins. The military needs to figure out how they want to bring these new technologies to bear and enable fiber-like communications and how they want to harden those technologies for harsh battlefield environments. Finally, they will also need to understand how they can use the same equipment and technologies where the conditions are not as austere and leverage the same infrastructure they use at home or work. For the military to deliver many of these new tools and capabilities into the fight, a high bandwidth, low latency network connection is a prerequisite for operational sufficiency. 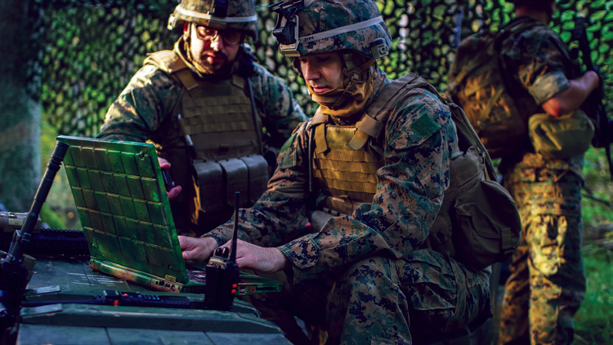 Today’s network-centric military operators demand high bandwidth connectivity to deliver the new tools, applications and capabilities they need to fight. Historically, high bandwidth and low latency has unfortunately been the eternal stumbling block in the domain of land-based combat operations. Today’s soldiers first encounter combat operations in barren, austere environments where the infrastructure we are accustomed to back home does not exist or is otherwise inaccessible or unreliable. This creates a problem for the military. How can those network-enabled tools and capabilities be sent to military personnel at the tip of the spear if they can’t connect? The answer has traditionally been through satellite. However, satellite has always come with its own challenges for the military. 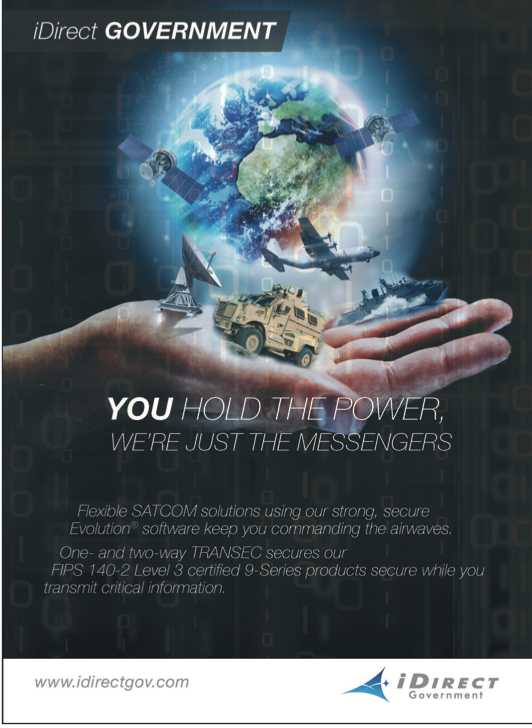 Traditional military satellite (MILSATCOM) services were delivered via satellites at the geostationary orbit (GEO); examples of this include narrowband communications provided by UHF Tactical satellites or other 56 Kbps satellite data networks. These systems were — and still are — in high demand. They are only capable of delivering so much capacity and bandwidth because of the distant orbit location. While deployed soldiers were in camp or on base, there wasn’t a problem. There was the time and space to establish ground infrastructure and deliver communications to the soldiers while they were there. They were able to have comms at pause, but they couldn’t take that connectivity with them, and that’s what the military has been looking for ­— Comms-on-the-Move. Luckily, there have been major advancements in the satellite and ground infrastructure industries that could start to make this dream a reality. Newer satellites, like those closer to the Earth in Medium Earth Orbit (MEO), have been flying since 2014. These satellites have high-throughput and low latency, the two key features enabling warfighters to do the most demanding tasks via network-enabled services, tools and interactive applications – from high definition ISR video to the highly detailed collaboration on GEOINT necessary for making informed troop movement decisions. New antenna and terminal technologies have also been introduced that can enable access to this new generation of satellites and deliver comms on the move. Unfortunately, they still are not small and mobile enough to be carried by soldiers on foot but they are perfectly fine for trucks, ships and large transport airplanes. Is COTM coming for the Dismounted Warfighter? The first computers took up the better part of an entire room. Today, that same computing power is dwarfed by something that fits in our pockets. In fact, there is more computing power in a Fitbit than that used to land a man on the moon. New technologies come out all the time, and they’re constantly getting better and smaller. Terminal and antenna technologies are not an exception. Newer, commercially viable electronically steered, phased-array antennas are smaller and more capable of handling the technical requirements of MEO satellite constellations. These antennas and supporting electronics are in development and testing right now, and should be available in just two or three years. When these new antenna and terminal technologies enter the marketplace, they’re going to open the door for the military to embrace MEO satellite constellations — and the high throughput, low latency connectivity that they enable — for COTM across all requisite domains: air, sea and land. That’s when the dream becomes reality —when soldiers will get communications at low latency and high throughput. These critical qualities enable warfighters to enjoy the same fiber-like response times they enjoy at home, and use the same mission critical interactive applications, like they do at home. This will revolutionize warfare. SES (Government Solutions) has a MEO satellite constellation today called O3b. Moreover, the company has funded and will deliver by 2022 its follow-on capability with 10-25 more capability — it’s called mPOWER. Through just seven satellites, mPOWER will deliver up to 35,000 beams globally below 50 degrees latitude. That is an impressive 100 Gbps per spacecraft of capability into the tactical edge tools base.